Kevin is an 11 1/2 year old brindle male born in 2006. He was part of the population from the blood bank facility located in Cherokee, TX that closed in November 2017. 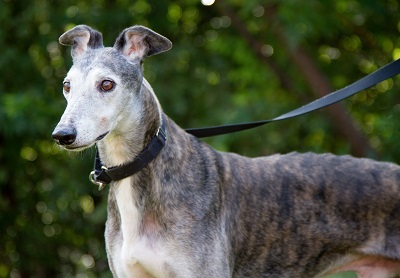 Kevin has completed all of his medical procedures and has been evaluated by GALT's veterinarians. Kevin is ready to find his forever home. It is not yet known if Kevin is small animal or cat tolerant. 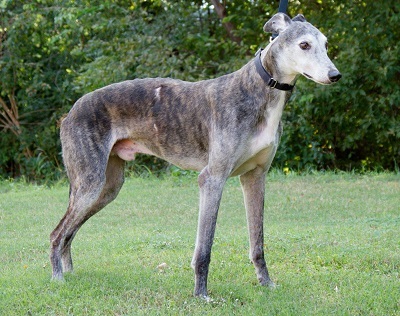 Please check back periodically for updates on Kevin as his journey to his forever home unfolds. Kevin is the best boy ever! When he walks, he looks like a big cat moving through his territory – sinuous and unhurried. In fact, if he had a slogan, it would be, why hurry? When Kevin first came to his foster home he was protective of his space and bed. Over time he has learned to live with other and no longer reacts to the other dogs stepping around him. He might need a similar ‘warming up’ period in his forever home. Kevin loves a routine – gets up at the same time, takes the same route through the yard, looks for meals at the same time, heads for the bedroom when it’s bed time. I’m not saying he’s stubborn, but he sets his mind to the way things should be, and he sticks to it! He also expects ear scritches each and every time he comes into the house or the office - and why shouldn’t he? Just don’t expect him to vary his routine, once it’s set. If I call him to come in while he’s in the middle of his yard tour, he will look at me and continue on his way. He does things in ‘Kevin time’. There are multiple dogs in his foster home, but Kevin seems really attached to his foster sister. He waits for her at the door when they go out in the morning or after meal; once she’s there he escorts her around the yard. So sweet! Kevin’s ideal home should be equally unhurried and comfortable with a routine. A yard to roam and a canine friend would be sublime. Just remember, super seniors are the best!